Meet three 2014 SPU grads who just became the first in their family to earn a bachelor’s degree. Every year at Ivy Cutting — a Seattle Pacific University tradition since 1922 — a graduating senior from a third- or fourth-generation SPU family rings the Centennial Bell, a symbol of inter-connecting alumni generations. This year’s Ivy Cutting inaugurated a new tradition: In addition to fourth-generation SPU graduates Alec Forsyth ’14 and Rebecca Magnenat ’14, first-generation graduate Carolyn Lara ’14 joined the bell-ringing crew. Lara is one among the 23 percent of Seattle Pacific’s student body who identify as the first in their families to earn a university degree. Nationally, first-generation students are twice as likely to leave their university degrees unfinished as students whose parents are higher education graduates. But this isn’t the case at SPU, according to Susan Okamoto Lane, director of multiethnic programs. 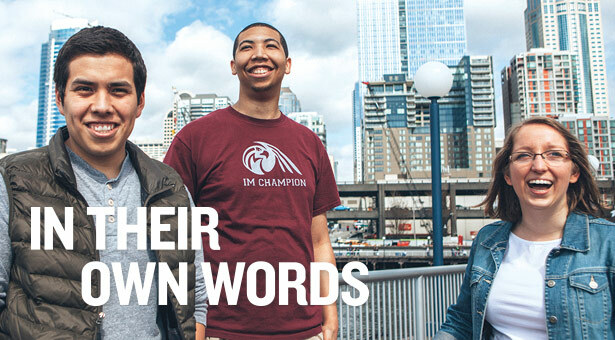 Students who participate in Early Connections, SPU’s orientation program for first-generation students and students from diverse ethnic backgrounds, graduate at the same rate as their peers. Among the many factors that correlate with this success: mentorship, knowing where to go when they “hit the wall,” and involvement in campus leadership. Below, Response interviews three of the first-generation graduates in the Class of 2014. 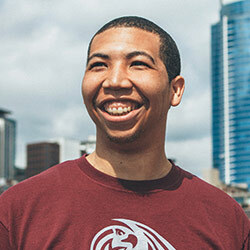 They talk about challenges they faced, how they made their SPU journey uniquely their own — and the families who stood by them along the way. Family: I grew up with my mom and little brother. My mom works for the City of Tacoma. My mom always knew my grades, and she made sure the thought of not going to college never crossed my mind. My mom had gone to community college. She wanted to transfer, but then she had me. I don’t think my mindset would be the same without my mom. She makes me more ambitious. When did you first get interested in engineering? JS: I have a really cheesy story. In middle school, I was in science class, and we had one week of doing experiments with batteries — and that week felt like forever, in a good way. It changed the way I thought. The idea of making something work in the way you want it to — it stuck with me. What was coming to SPU like for you, academically? The classes move so much faster — it was a lot to take on at once. In middle school, high school, everything was just clicking. When I came to material I didn’t understand, that took a while to learn how to learn. Time management was probably my biggest issue. I did poorly in some of my classes at first, but as it kept going, I started picking it up. I was learning throughout, but it would have been nice to have those skills present before coming to school. Who mentored you on campus? 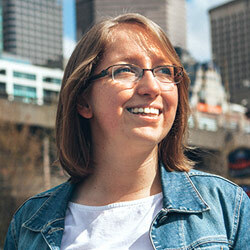 Melani Plett, professor of electrical engineering. I have like six greeting cards from her. Any advice for other first-generation students? I had friends who didn’t even apply to college because they “knew” they couldn’t afford it. But how do you know unless you apply? Family: I’m the second-oldest of four sisters. My mom stayed at home until I started high school — and then started her bachelor’s degree the same year I did. My dad was a house-finisher, but when the housing bubble popped, he didn’t have work for a while. During that time, my mom was the registrar at Baker Middle School in Tacoma. Then, she thought about what she wanted to do once all the kids were out of the house and decided she wanted to become a teacher. I was part of a program in high school, Washington Achievers, that taught me how to get into college, and I was able to pass that knowledge on to her. How did you decide SPU would be a good fit for you? RB: I attended four preview events, just to make sure. When I was a senior in high school, my grandma was diagnosed with Lou Gehrig’s disease. I found out Thursday, and then on Friday I came to a preview event. Ineliz [Soto-Fuller, assistant director of admissions] asked how I was doing. I started crying and telling her about my grandma. She prayed for me. I knew that if something happened, I wanted to be in a community where people would respond that way. How did you end up with a double major? Capitalize on the resources available to you. The staff and faculty at a university want you to succeed. Family: I’m the oldest; I have a brother who’s a freshman at Central Washington University. Both of my parents came from Mexico about 25 years ago, and they became U.S. citizens five years ago. My dad builds windows, and my mom is a cafeteria lady at a middle school. When did you choose SPU? EM: I didn’t decide until a week before high school graduation. At the time, I thought I was going to go to Tacoma Community College, because those numbers seemed a lot more realistic. My parents didn’t want college to be something that I had for one year and loved, and then the next year I just couldn’t afford it. When they told me they were on board, I think they saw how much I wanted to go to college, to leave home, and have the whole college experience. How did you get involved in student leadership? 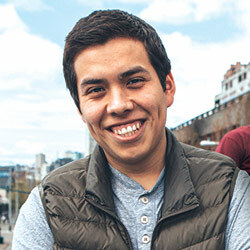 I was not involved in high school, so I didn’t know I had it in me to be as involved as I was at SPU. I have a lot of strong, wise women speaking into my life at SPU. They are my mentors who encouraged me and continue to encourage me into certain leadership positions. A lot of what I do is driven by my faith. When I envision the kingdom of God, I envision everyone invited to the table, celebrating all cultures, and I want to be a part of the work at SPU that seeks to magnify that. Don’t be afraid of the scary unknown. Seek help from other students who’ve been in the same shoes that you are in. Know that all the hard work that you are going to put in will be worth it.